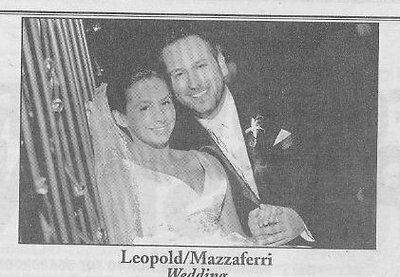 Joanie & Richard Leopold of Northbrook, Illinois, announce the wedding of their daughter, Lizzie Leopold of Northbrook, Illiniois, to Brian Mazzaferri of Glenview, Illinois, the son of Graciela Kenig & Timothy Mazzaferri of Glenview, Illinois. They were wed on August 21, 2010, at the Fairmont Hotel, Chicago, Rabbi Dr. Douglas Goldhamer was the officiant. The maid of honor was Elizabeth Millman, along with Nick Blaemire as best man. The ring bearer was Nathan Felix, bride's cousin. The flower girl was Ilana Felix, Bride's cousin. The bridesmaids were Dr. ELizabeth Pino, bride's brother's fiancee, Caren Leopold, bride's cousin, Melissa Bloch, Roche Janken. The groomsmen were Adam Scher, groom's cousin, Joe Leopold, bride's brother, William Prokopow, J.J. Italiano. The ushers were Kenneth Levin and Marty Sirvatka.